Harry S. Truman was born in Missouri on May 8, 1884. He was named for his mother's brother, Harrison and the "S" in his name was in honor of his grandfathers, Anderson Shipp Truman and Solomon Young. The "S", however, didn't stand for a name and it actually can be written either with or without a period after it. Harry's father sold horses and mules and had a hard time making a living. When Harry was three years old they moved to his grandfather's farm where he experienced a happy childhood. When he started to school, he was diagnosed as farsighted and the doctor prescribed thick glasses to correct his vision. He could see much better, but the children began to tease him and call him "four eyes". As a result he was often lonely and retreated into books and his studies. He excelled in school. The family bought a piano and Harry insisted on learning how to play it. He enjoyed making music all his life. Some have said the Missouri Waltz was his favorite song, but he said he heard it so much in the campaign, he was tired of it. Harry never attended college. He wanted to, but due to financial circumstances he had to go to work to help his father support the family. He worked as a clerk in a Kansas City bank. When his father had a chance to take over the family farm, his sons had to help him with the work so Harry left the bank. Farming was hard work because at that time all the plowing and planting was done with horses and mules. When he finished working in the fields, he then had to care for the animals. He met his wife Bess when they were children attending Sunday School together. He had a crush on her throughout the years and finally married her on June 28, 1919 after he finished serving in World War 1. He was thirty-five years old and she was thirty-four. Bess's mother didn't approve of the marriage because she thought Harry wasn't good enough for her daughter. However, it seemed to work out pretty well because it is said that Harry and Bess probably had the happiest marriage of any of the presidents. After they married he had to find a way to make a living. Harry and a friend Eddie Jacobson opened a men's clothing store. A men's clothier was called a haberdashery* (HAB uh dash er ee). Things went well for a couple of years, then there was a recession and they had to go out of business. Friends encouraged him to enter the political scene. He ran as a Democrat for the office of county judge. With some influential backing he won the election and kept his promises to build better roads and reduce the county's debt, which he was able to cut in half. In 1924 the Truman's daughter Mary Margaret was born. They called her Margaret and she was the apple of her daddy's eye. In later years when Paul Hume, a music critic, severely criticized her singing, her father lambasted the critic, calling the review "lousy" and threatening to punch him in the nose if he ever met him. At that time the Ku Klux Klan was a powerful group. Truman did not approve of them nor their tactics. He went to a rally to tell off its members. He had his say, but they were powerful enough to keep him from being reelected. Two years later the group's power had weakened and Harry again entered politics. He was an incredibly honest man and always did what he thought was the right thing to do. Even though he was supported by the Pendergast political machine, he would not acquiesce* when he differed with them. In 1934 he was elected to the United States Senate from Missouri and reelected six years later. Franklin Roosevelt was President of the United States. He had served for three terms and was preparing to run a fourth time. ( Today presidents can only serve two terms.) Roosevelt was looking for a new running mate for Vice-President. He was in poor health and Democratic leaders knew they needed a strong man who could step in if the president were to die. He chose Harry Truman to be his running mate, Roosevelt was busy conducting World War 2 and did not involve his vice-president very much. Hence, when Roosevelt died on April 12, 1945, Truman was thrust into a role for which he was ill-prepared. Truman was quoted as saying "I felt like the moon, the stars, and all the planets had just fallen on me". The war in Europe was over on V-E Day (Victory in Europe Day) when Germany signed an unconditional surrender. But the war was just half over, there was still Japan to deal with. Truman was handling things well. After a month in office his popularity rating was 87 percent! Truman went to Potsdam, Germany to meet with the allies, Winston Churchill of Great Britain and Josef Stalin of the Soviet Union. It lasted for two weeks. In the middle of the conference Churchill lost the election and the new prime minister Clement Attlee took his place. The men agreed that Japan must accept an unconditional surrender just as Germany had done. They also decided the German leaders must stand trial as war criminals, and they divided Germany into two countries, East Germany and West Germany. They divided the German city of Berlin into four sections or zones to be occupied by the United States, the Soviet Union, Great Britain and France. This came to be known as the Potsdam Agreement. While he was at the meeting in Potsdam, Truman received word the United States had a new weapon. An atomic bomb had been tested in the New Mexico desert. Using that bomb could end the war quickly and save thousands of allied lives. On July 2, 1945 Truman gave the leaders of Japan a chance to surrender* and they refused. On August 6, at his order, the first bomb was dropped on Hiroshima. Approximately 140,000 Japanese died as a result. They were given a second chance to surrender, but they would not. 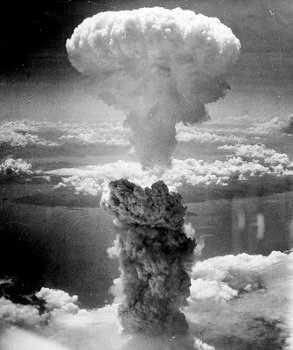 Three days later a second atomic bomb was dropped on Nagasaki and about 70,000 people died. On August 14 Japan surrendered. After World War 2 had ended, Truman feared countries in need of economic aid would accept it from Russia and be in danger of falling to Communism. He announced that the United States would give aid to Greece and Turkey, as well as other democratic countries. This became known as the Truman Doctrine. A short time later Secretary of State George Marshall announced aid to help war-torn countries rebuild, the Marshall Plan. Germany and Italy, our former enemies accepted the help. There was a problem getting aid to the Germans in Berlin. The Soviet Union refused to let the allied trucks cross its territory to deliver the aid to the people in the city. Truman and his advisers came up with a plan to airlift the goods in cargo planes, the "Berlin Airlift". 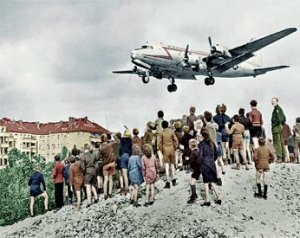 Over the period of a year there were 277,000 humanitarian* flights to deliver food and necessities to the people of Berlin. 101 people lost their lives in air crashes. About the same time Truman was working for civil rights for African Americans making it easier for them to be able to vote. People in the South felt they had been betrayed by Truman, but he wanted to do the right thing. Truman's opponent in the 1948 election was the Republican candidate Thomas Dewey. The editors of the Chicago Tribune were so certain Dewey would win they printed the paper proclaiming Dewey the winner before the final results were in. By the time it was printed, Truman had won and the editors had to print a retraction. * A gleeful Truman is shown holding up the erroneous* headline. Harry Truman was not a wealthy man. His presidential salary of $75,000 didn't go very far because he had to pay all the White House expenses out of his salary. One year he only made $4,200 after he had paid the expenses. They raised his salary to $100,000 plus $50,000 for expenses, but White House costs kept rising also. The 150-year-old White House was badly in need of repair. The leg of Margaret Truman's piano fell through the floor. Something had to be done, so the Truman's moved into the Blair House from 1949-1951 while the reconstruction took place. The building was gutted and completely redone at a cost of $5.7 million. During the time the Trumans were staying at the Blair House there was an assassination attempt on the President's life, but the assassins were not successful. A police officer was killed and two others wounded, but the president was unharmed. The Korean war was going on while Truman was in office. It was called a "police action" because war was never officially declared. Truman put General Douglas MacArthur over the troops, but MacArthur began to expand the war and had different purposes than the president. He was fired and replaced by General Matthew B. Ridgway. 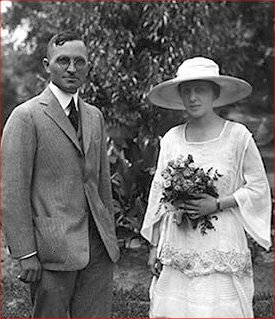 When his presidential term was over, President Truman and his wife Bess returned to Independence, Missouri to their home. A crowd of 10,000 people met them at the station and there were more than 5,000 at the house to greet them. Every morning he would take a walk carrying a cane with him from his large collection of over 100 walking canes. During his retirement he received an abundance of mail. He answered every letter personally. Each letter needed a 3-cent stamp and the first year out of office he spent nearly $10,000 on postage. In 1953 he decided they would take a road trip, just the two of them. They tried to travel incognito,* but that didn't last long when people realized they were on the road. Sometimes the reporters would get to their destination first and wait for them to arrive. The trip lasted 19 days and they traveled 2500 miles across America. He gave a speech in Philadelphia for the Reserve Officers Association. In it he issued a caution. I think that those who talk about our defense program being too big may be letting their pocketbooks obscure their judgment. It is only natural to wish that we didn't have to tax ourselves so much for defense. This is perfectly human. We would all like lower taxes. But I warn you soberly and plainly: Do not be misled by the desire for lower taxes into cutting corners on our national security. Truman took an office in Kansas City and began writing his memoirs* and making plans for a presidential library. He published two volumes of his memoirs and the Harry S. Truman Presidential Library opened in 1957. 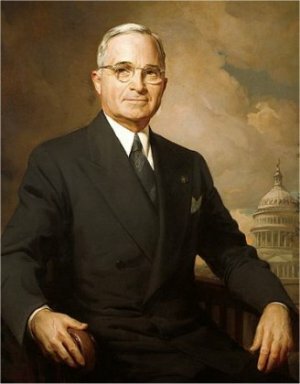 On December 26, 1972 Truman died at the age of eighty-eight. This biography by Patsy Stevens, a retired teacher, was written October 16, 2012. Press "Go" to search for books about Harry S. Truman. This page displayed 18,506 times.